IRELAND HAS BEEN “the good performer” out of the bailed-out European nations, but countries should be focused on “growing themselves out of debt” rather than trying to get relief on their loans. 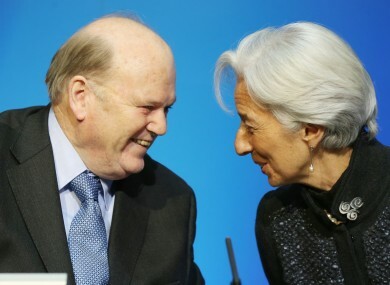 International Monetary Fund (IMF) managing director Christine Lagarde, in Dublin to meet with Irish politicians including Finance Minister Michael Noonan, delivered that assessment after earlier pouring cold water on the idea of a Europe-wide debt conference. When asked if Ireland should expect some help with its debts as the “good boy in class”, Lagarde said there was “no question” Ireland’s recovery after the troika’s bailout had been successful and other nations should follow its lead. “Hopefully this is the collective route that Europeans can adopt,” she said. “Because there is an issue of confidence, there is an issue of reliability on the financial markets which has to be taken into account. In an earlier interview, she told The Irish Times that “collective endeavours are welcome but at the same time, a debt is a debt and it is a contract”. Her comments follow a proposal from the Greek anti-austerity Syriza party, which is on track to take power in the country’s election this weekend, for a pan-European “moment of solidarity” to deal with crippling bailout debts. Irish political leaders have lent support to the move which could include some relief towards repayments on the €67.5 billion the country received in loans. Last year the Republic’s interest bill on its debts hit nearly €7.5 billion, a figure which continues to rise. Meanwhile, Syriza has been threatening to ditch austerity policies linked to Greek loans, a move which puts it on a collision course with EU leaders and could potentially end in the country leaving the eurozone. But Lagarde said in the interview that changing the terms of a loan would have “consequences on the signature and the confidence in the signature”. When asked about plans to cut taxes on foot of the country’s economic recovery, Lagarde said she hoped the good work would no be “wasted by excessive measures”. “What I hope is that all the effort and all the sacrifices that were made in the last five years will not be in vain,” she said. Lagarde will also address a conference about the lessons Ireland has learned from the financial crisis this afternoon. European Central Bank (ECB) board member Benoit Coeure is also due to attend today’s conference, a fact that banking inquiry members have taken umbrage with. Fine Gael’s John Paul Phelan wants Coeure to explain why he has accepted an invitation to the Dublin Castle event while refusing to attend the inquiry hearings. “The conference — which combines a retrospective on Ireland’s EU-IMF supported program with more forward-looking discussions — aims to draw lessons for Ireland, the European Union and the IMF, as well as other countries facing similar challenges,” he said. “It will examine areas such as which policies were most successful and why; what should have been done differently and what are the broader lessons for stability of the euro area. The IMF’s permanent representative to Ireland left last June following the country’s bailout exit. Email “Ireland is the IMF's star pupil. But that doesn't mean you're getting any debt relief”. Feedback on “Ireland is the IMF's star pupil. But that doesn't mean you're getting any debt relief”.